For the past few years, the device you have accessed Google with has determined the style of the search engine results page (SERP) you get back. On desktop you’ll see the familiar list view, while on mobile and tablet you’ll be served up cards, also known as Material Design in Google’s world. But 2017 could be the year that Google makes the leap and unifies the way we experience results across all devices. The rise of card based SERPs is upon us. Mobile-first has been a central focus in Google’s approach to search result design for some time now. Back in October of 2015, Google, along with many publishing and tech companies, spearheaded the AMP project (Accelerated Mobile Pages) to improve the speed in which content is served to mobile users through Google search. 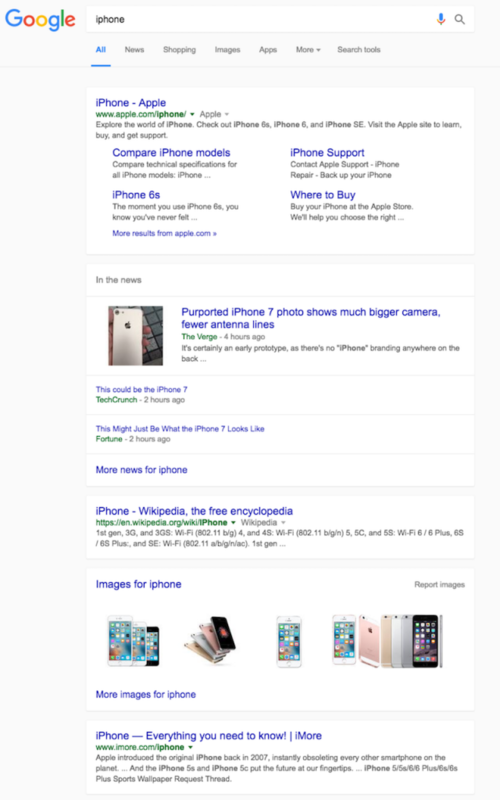 In February of 2016, they removed the appearance of the right-hand-side paid search results on desktop in favour of a single column layout in-line with their mobile design. In May they announced their new personal assistant, Google Assistant, a superior version of Google Now that will enable mobile users to communicate in a two-way conversion with their phone to retrieve rich SERP results. And a few months later in November, Google announced they would soon be implementing the mobile-first index, a change in the way Google indexes pages by crawling them as a mobile user as opposed to a desktop user. Perhaps the most interesting change, however, is just around the corner. Between July and September last year you might have noticed a slight difference in the way your Google SERPs looked. Google was testing a card based system, very similar to how it currently serves up mobile results. Users were chosen at random and served the new card style layout for a few hours or days before it reverted again. The layout (which you can see below) could well be implemented this year off of the back of Google’s testing. Why unify mobile and desktop SERPs? So, why would Google be opting to roll out its mobile view across desktop too? Well, there’s a few reasons. For one, cards give great flexibility to Google in terms of how they serve up content. Say you search for your favourite actor, Google could serve you a rich snippet about them from IMDB first, then you might have a link to their own website in the next card or even a paid link, and below that another card with all of the films they’ve been in. Essentially, it gives them the ability to serve up rich content interspersed with organic and paid results. Considering how effective Google is becoming at pulling out the most useful content and surfacing it at SERP level, we could see Google becoming more of a hub of instant answers, slowly removing the need for us to ever leave the results page. Another reason for unifying the SERP is the rising trend of people using and owning multiple devices, which calls for the creation of a more joined up experience. In a recent report from Comscore, research showed that minutes spent on mobile devices in the UK rose by 186% in 2016. Interestingly however, mobile doesn’t appear to be cannibalising desktop, the usage of which still rose globally by 4% last year (it stayed about the same in the UK region). The same report states that, as of 2016, the majority of people in the UK were using multiple devices, as opposed to exclusively using either mobile or desktop. This seems to be a common trend across other countries too, so it makes perfect sense for Google to join up their design ethos across all devices. The final reason for this step is Google Assistant. If you’ve ever used Google Now on an Android device, you’ll already be familiar with the premise of what Google Assistant is going to offer, which is, in essence, speaking to your mobile device to retrieve rich search results. The main difference with Google Assistant however, is that you’ll be getting a two-way conversation, giving it the ability to function more like a personal assistant for diary management and your daily life, instead of just returning web search results. While Google Assistant is currently only in preview, it will be rolled out more extensively this year, and guess how it delivers information on your mobile display? That’s right, cards. See where I’m going with this? 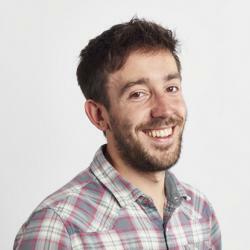 In the end, Google are making sure that whether you’re looking up something on your work computer during lunch, sat on the sofa at home with your tablet, or speaking to your phone while walking down the street, it always feels like the same experience. It feels like Google. What does this mean for digital design? This shift in attitude to make sure that what is being designed is the most valuable and accessible experience for users is hopefully a shift in attitude that we will see across all of digital design. At Storm, we are embracing this. We help organisations transform their digital experiences, so that their users feel understood and supported. Why not get in touch to see what we can do for you? Is Artificial Intelligence Conquering the Consumer Market?